Each week my five year old daughter watches me create a project for Crochet Spot. Oftentimes she is the source of my inspiration. For a couple weeks now she has been begging me to crochet a teddy bear for her. Any kind of teddy bear was her request. So, this week I made this appliqué to add to one of her shirts. She has already put in another request for a pink one next time. This pattern is really easy and can be adjusted several ways. 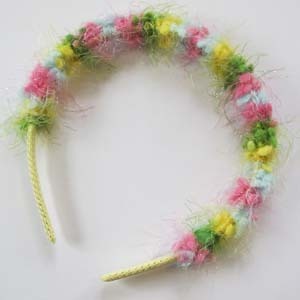 You can change the muzzle color to a slightly darker or lighter shade, add beads or french knots for the eyes. Have fun! You can also find more applique patterns in the Applique Section! I think sunflowers are one of the most beautiful flowers in the garden. Their smiling faces, which follow the movement of the sun, remind me to always look for the bright side of every circumstance and to turn my back on dark days. I find crochet easily as therapeutic as enjoying a beautiful flower garden. So, I decided to combine the two this week. This project can be whipped up in no time. 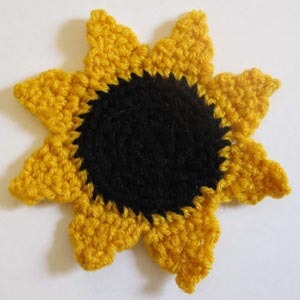 I plan on making several sunflowers, joining them at the petals, and creating a lacy scarf. Another use for this easy pattern is coasters! I have been harvesting strawberries like crazy in our garden. I simply can’t resist their tempting sweetness. If held to the sun their sugary flesh is almost metallic in color. 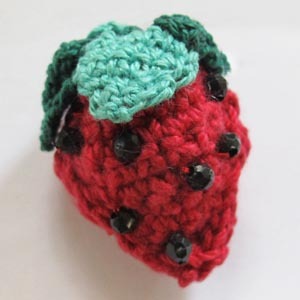 This week I decided to take my love of strawberries one step further and create this crochet pattern for you to enjoy. There are so many uses for this pattern, from decorating kids apparel to a zipper pull on your purse. Or, if you don’t want your strawberry to be three-dimensional, just make one half of the berry and use it as a cute applique on kitchen linens! The sky is the limit! 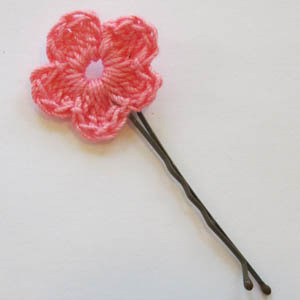 This flower is so easy and simple to crochet but it can be used a million ways. Lately I’ve seen crocheted flowers popping up everywhere on clothes, toys, accessories, and home decor. I love the fact that they can be made in little time and yet these simple appliques can really spice up anything their applied to. In your spare time crochet several using scrap yarn and save them in a jar for upcoming projects. If you have some extra bobby pins around the house this is a great way to infuse new life into them. I have seen some really cute hair accessories everywhere I turn. A lot of my favorite department stores’ accessories sections have a large area devoted to hair barrettes, bows, bobby pins and headbands. While I must admit I’ve added several new hair doodads to my collection I have taken to making my own as well. I embellished this child’s headband in a matter of ten minutes for my daughter (that includes hunting down the headband itself). I love yarn that graduates in color and texture. 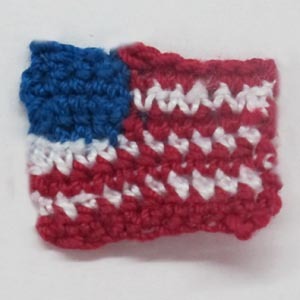 This project is a perfect one for using up your treasured yarn scraps. One thing my garden can’t be without is several hills of watermelon. My family can’t resist it’s mouthwatering sweetness; it’s my daughter’s favorite summer treat! 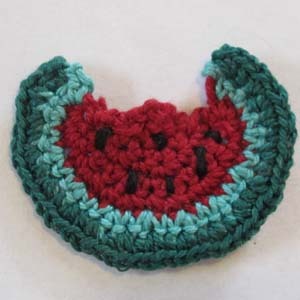 So, I created this watermelon applique to embelish her summer dresses. I’m also going to sew it on one of her white t-shirts to add a touch of pizzaz! Why pay lots of money for something similar at a boutique when you can make it yourself for little to nothing! This applique would also be great sewn onto picnic napkins to catch some of the juicy sweetness of summer’s favorite fruit. Spring is here! I am so glad, aren’t you? I can’t wait to spend my evenings outside as the weather warms up and the daylight lengthens. You just can’t beat the wonderful scent of lilacs, daffodils and tulips in the air. It won’t be long and butterflies will be visiting my garden again too. I just can’t wait to see them peacefully resting on my flowers. 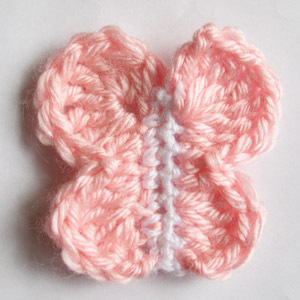 In anticipation of their arrival I created this butterfly pattern for you this week. 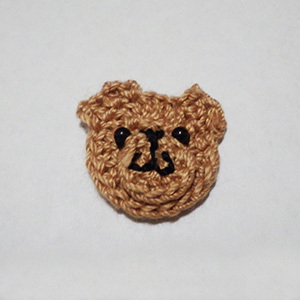 You could use it for a pin or an applique. 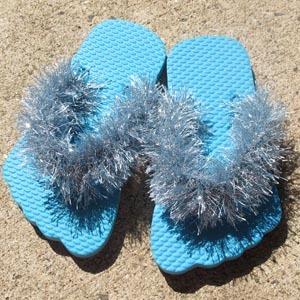 It’s great for kid’s clothing, totes, and hats. 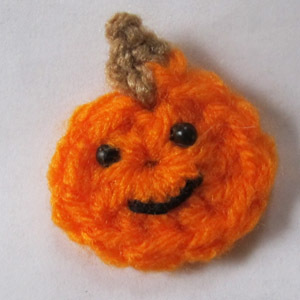 You could also sew it on baby blankets and accessories!